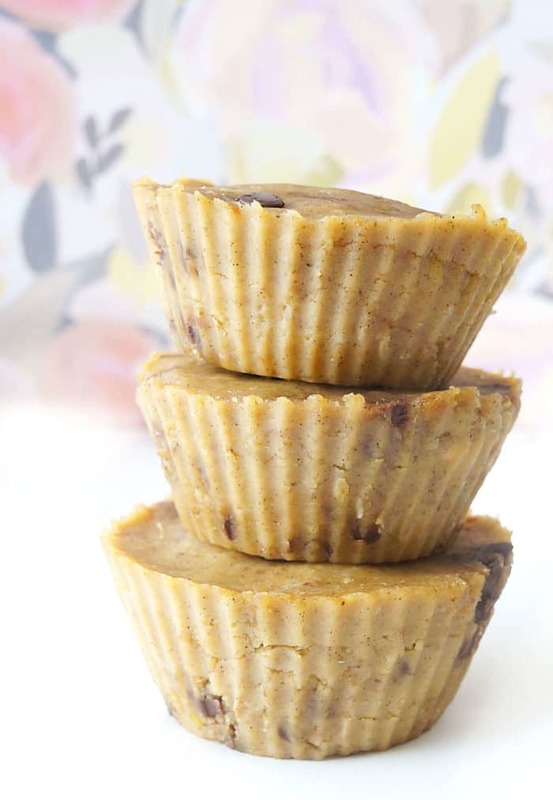 These healthy no-bake cookie dough cups make a delicious and nutritious treat or snack on the go (great for pre or post workout)! 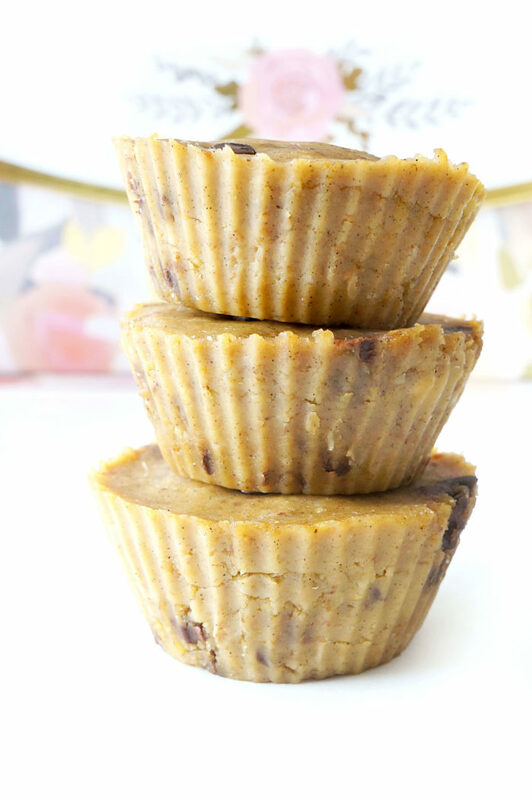 They’re a good source of protein and fibre and are also vegan, gluten-free and dairy-free! For as long as I can remember, I’ve always loved the taste of cookie dough. I mean, really, who doesn’t? I have fond memories of helping my mom make cookies when I was little and sneaking little pieces of cookie dough out of the bowl when she wasn’t looking. Although even to this day, I’m tempted to sneak cookie dough every once in a while (thanks to my sweet tooth!) I know it’s not all that healthy and it’s definitely not going to do my waistline any favours…let’s just be real here. So of course, like always, I had to come up with a healthier but equally tasty alternative! 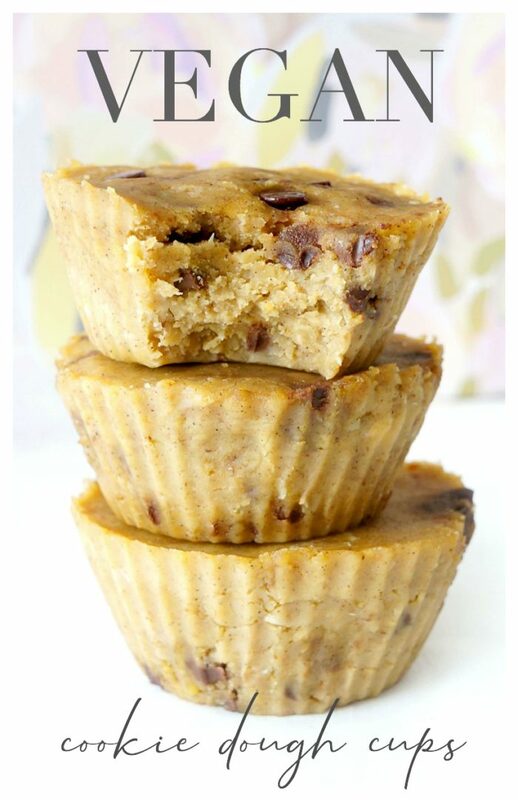 A few years ago I made some healthy cookie dough energy bites for a nutrition event that I was hosting at a fitness centre, and they got rave reviews from the members who stopped by to try them. I had intentions of eventually posting the recipe, but never seemed to get around to it. Recently, I actually ended up losing the recipe since a lot of the files on my computer got wiped out when I was trying to transfer them over to my other computer (I’m still trying to get over that…it’s a very sensitive topic)! So once again, I had to reinvent the recipe. 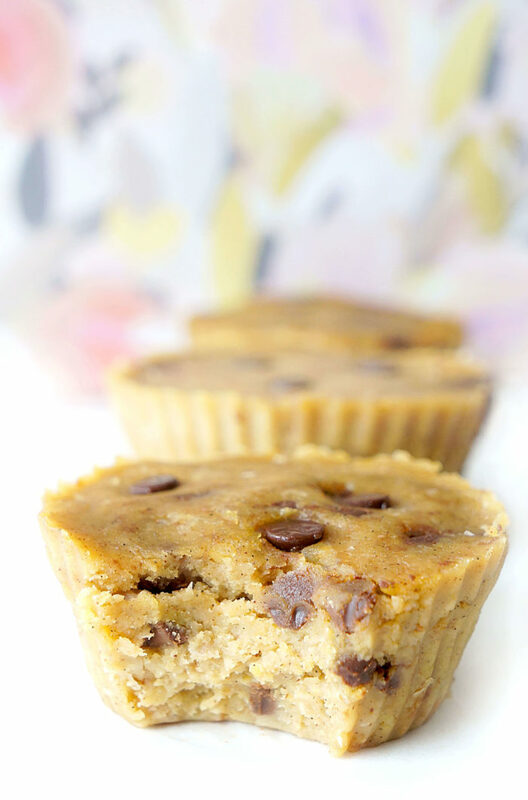 I actually think this one tastes better than the previous recipe and rather than doing balls, I made them into cookie dough cups instead! One thing I’ve realized since becoming a mother is there isn’t a whole lot of free time. In fact, these days, it’s difficult to find any free time at all during the day! So finding the time to roll up 50 little energy balls? Ain’t no mama got time for that! That’s why I’m loving cups these days! They make life SO much easier AND also make the perfect little portion-controlled snack. So let’s move on to the juicy stuff. To make these cookie dough cups, all you have to do is throw all of the ingredients, except for the chocolate chips, into a food processor . I added a scoop of Genuine Health Fermented Vegan Proteins+ powder which turned out really good and also upped the protein, but the protein powder is totally optional. However, you may want to add an extra tablespoon of maple syrup if you don’t add the protein powder. Next, just push the button and blend until a smoothie consistency resembling cookie dough is formed. Then, you simply mix in the mini chocolate chips. I like to do this with my hands for even faster distribution. If you don’t like to get all that gunk in your fingernails, try using some kitchen gloves. It’s much more sanitary too! I actually use mine all the time during cooking and baking, especially when making meatballs or energy balls and it saves from trying to wipe the sticky mess off your hands. Just one more time-saving strategy! and smoosh the cookie dough into ten cups. I like to use a spatula to pack it down and create a nice smooth surface. Then simply pop the cups in the freezer for about an hour or so. The beauty of these cups is that you can either eat them from frozen — it’s like cookie dough ice cream! Or you can let them thaw in the fridge or at room temperature for about 2-3 hours to allow them to soften up a bit. What I love about these little morsels is that the flavour and texture both resemble cookie dough! 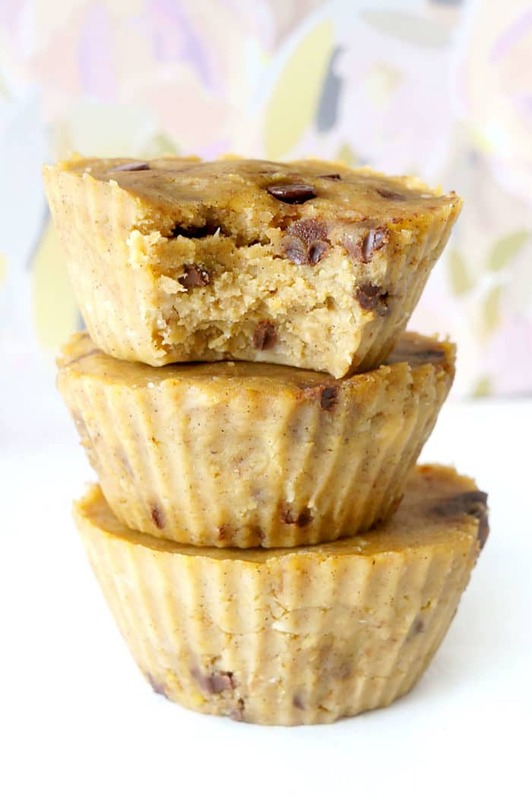 BUT, unlike regular cookie dough, these cups contain a dose of fibre, protein, iron and healthy fats from the chickpeas and PB and are much lower in sugar. Additionally, because they’re in cup form, they’re really easy to take on the go. I’ll typically pack one in a little plastic ziploc bag and take it with me for a pre or post-workout snack or quick bite to eat when I’m running around. Such a handy little snack especially if you have little ones running around…and they’re great for the kids as well! This delicious snack definitely tops the list these days! What are some of your favourite on the go snacks? Looking for more healthy snack ideas? Get my FREE Download for 50 Healthy Snack Ideas here, along with all my other free printables and resources! Place all of the ingredients except for the chocolate chips in a food processor and blend until a smoothie cookie dough-like consistency is formed. Mix in the mini chocolate chips using your hands or a large spoon. Place 10 silicone cups in a muffin tin and divide cookie dough mixture among each of the cups, pressing the mixture into each cup so that the surface is smooth. You may wish to add a few additional chocolate chips to the top of each cup. Place the muffin tray in freezer for about 1-2 hours until the cups are frozen. Serve from frozen or allow to thaw in the fridge or at room temperature for 2-3 hours. Store cups in a container or ziplock bag in the fridge or freezer. These bites look AMAZING! Cookie dough anything never fails! Thanks so much! Always up for some cookie dough! These look so delicious!! I’ve always loved cookie dough too!! Isn’t it just the best thing ever?! Love it!! Thanks Deborah! 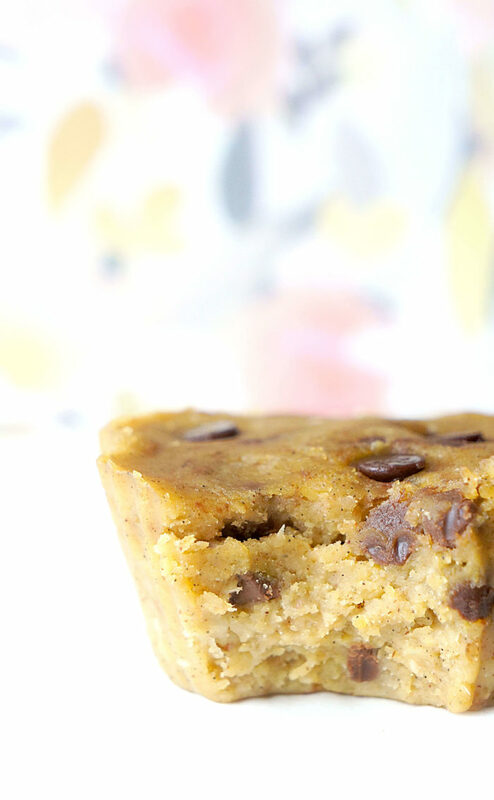 The chickpeas give it that nice cookie dough texture when blended together with the other ingredients. That’s why I love chickpeas — they’re so versatile! I have every single one of these ingredients on hand! I’m actually doing a happy dance right now. :-) They look so good! Awesome Debbie! You should definitely try them out! 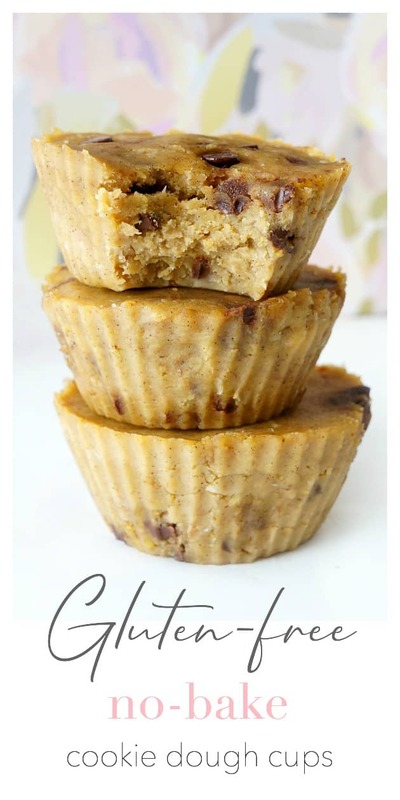 This cookie dough cups looks sooo delicious. I never had anything like this before – I love addition of chickpeas. That’s so innovative. It’s protein packed which I love really much. I’ll be making this soon. What can I substitute in place of coconut oil? You can try just leaving the coconut oil out of the recipe. It’s mostly used to help keep the cups more solid at room temperature, but if you store the cups in the fridge or freezer, they’ll harden up a bit. I haven’t tried making them without the coconut oil, but please let me know how it works out! It’s my first time using chick peas (so I made sound silly asking,) how would you cook them for this recipe? Do you allow them to cool down before adding in additional ingredients? Hey Chelsey! That’s not a silly a question at all! There are a couple of different methods that you can use. The easiest would be to use canned chickpeas and rinse them really well. They’re already cooked and are at room temperature, so no need to wait for them to cool. The other methods you can use involve using dried chickpeas found in a bag. You can either use a long soak method which consists of adding the dried chickpeas to a large bowl and covering them with several inches of water. As the chickpeas rehydrate, they triple in size, so adding plenty of water is key. Soak the beans 8 hours or overnight. After soaking the beans, you can cook them (see how below). For the quick soak method, add the beans to a large pot, cover with several inches of water and bring to a boil. Boil for 5 minutes then take the pot off of the heat and let the beans sit in the water for 1 hour. After soaking the beans, you can cook them (see how below). Whether you use the long soak or the quick soak method to rehydrate your chickpeas, you will still need to cook them. After the chickpeas have been soaked, drain and rinse them well. Add them to a large pot, cover the chickpeas with several inches of water, and bring everything to a boil. Reduce the heat and simmer until they reach your desired tenderness, 1 and 1/2 to 2 hours. When simmering, you can keep the pot lid off or on, but leave it slightly ajar (allowing some steam to escape while cooking), to ensure that they reach the right consistency to incorporate them into the cookie dough cups. After they have finished cooking, I would allow them to cool to room temperature before mixing them with the remaining ingredients. Hope this helps!